Since Brett’s tragic death in 2001, The Brett Bentley Crawford Foundation has been providing creative educational opportunities for children and young adults as they work to overcome life’s challenges. This mission resonates with the struggles and victories that Brett worked through in her own life. The Foundation initially focused on making a difference to children in the communities that Brett called home: providing awards, scholarships and subsidies for educational programs in Detroit MI, Naples FL and Ontario, CN. In 2008 this focus was dramatically redirected when the Foundation was invited to build a school in Brett’s honor in Nicaragua, the second poorest country in the western hemisphere. The opportunity was attractive as it provided the Foundation with the ability to impact hundreds of young lives for generations for the cost of one scholarship in the US. The return on the Foundation’s investment, in terms of its impact on the lives of young children, was far greater than anything the Foundation had been able to achieve to date. It was so compelling that for the first time in its history the Foundation ventured beyond its own resources and asked friends and family to support its efforts in such a worthy cause. While the Foundation will continue to support the local educational activities it has historically underwritten with its own resources, all monies received from donors, along with the majority of the Foundation’s resources, will be used to continue the Foundation’s commitment to build schools in Nicaragua. The first Brett Bentley Crawford School was completed in 2012 after four years of delays with the Nicaraguan government. It is providing an education for over 600 students each year in one of the poorest areas of Managua, the nation’s capital. The Foundation would not have been able to undertake this venture in Nicaragua without the assistance and support of its partner, SchoolBOX, a Canadian charity that was started by one of Brett’s Canadian friends. SchoolBOX has been active in promoting education in Nicaragua since 2006. With SchoolBOX’s support, the second “Escuela Brett B. Crawford” was completed in 2013 and provided an education for over 200 students in its first year. 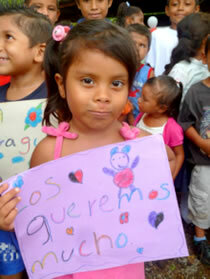 We have worked to build 3 other Brett Schools and empower over 2700 students on an annual basis i Nicaragua. The attraction to building schools in Nicaragua is that for a relatively small investment the Foundation is able to provide an education to needy children that otherwise would not have had the opportunity to even learn to read and write. With her schools, Brett’s bright light continues to shine as a blessing on not just a few selected children, but entire communities for generations to come. By reaching out to provide educational opportunities to underprivileged children across North and Central America, the Brett Bentley Crawford Foundation has made a remarkable difference in the lives of children in need. With the completion of Brett’s third school in a couple of months, over one thousand students will be gaining an education in schools made possible by the Foundation. Without the generous support of the Foundation’s donors, these schools would not have been built and these children would have perpetuated the cycle of poverty into which they were born. The enthusiastic support this school initiative has received is not only greatly appreciated by the Foundation, but is invaluable to the children of Nicaragua who, for the first time in their lives, have the opportunity of a meaningful future. Thank you so much.